Some days, you must choose grace. Not just choose to give grace, but choose to receive it, take it in, soak it up past the superficial skin and let it seep down deep into your soul, into the places of self-condemnation. Let it erase the records of wrongs, mistakes and imperfections. Like when you shop at at the grocery story and you forgot your coupons. And they don’t have the chicken you need, which messes up your meal plan for the week. So you skip out on exercise because you had to trek to a second grocery story to find said elusive chicken. And during the rush to put away the groceries, all you can see is the dirt in the corners of the kitchen floor, the apple juice splatters, the toothpaste splotches in the bathroom sink, and the laundry piled in the basket. At the end of the day, what’s on your mind is mess and failure, what you didn’t accomplish….how your kids didn’t practice the piano, your toddler threw a tantrum every hour, and you didn’t finish the project you’re working on. I collapsed onto the sofa after having that day and read to my daughters quickly. When we finished the chapter, my daughter reached over and turned down the corner the page to hold our place. And I felt the full rush of failure. I’m a page-turner-downer from way back. Despite a lovely, inspirational, unique and extensive collection of bookmarks, I fall back on a long-established bad habit. I just dog-ear my page and snap the book shut. Unfortunately, it’s a bad habit I’ve unwittingly passed along to these daughters of mine. In fact, it’s so extreme they’ve even coined a term for it, transforming the word “chapter” into a verb. “Mom, don’t close the book until we ‘chapter it!” they say and I dutifully slip the corner of the page down. Watching my daughter turn down that page without hesitation, I heard that voice in my head: I’m passing along my bad habits to my children, handing them down like ill-fitting jeans and worn-out shoes. Unfortunately, some of them aren’t as immaterial as dog-eared book pages–like stressing perfection too much, having too little patience with ourselves and others, always wanting to be in control, and not accepting grace in the wake of messy failure. Don’t we all have days where it seems we meet with more failure than success? Where Satan can barrage us with reminders of the mistakes from long ago and the crazy mishaps of today? Or maybe you feel it at your job or in your ministry or with your friends. What you should be doing. What you failed to do. What you said that was wrong. How you fall short. How you could be better. The pressure of perfection is far too much for our imperfect selves tripping along in an imperfect world. And that’s the point, sweet friend. It’s not to get everything right. It’s to get what really matters right. It’s to do our best and just lay it all out, insufficient as it is, as an offering before a gracious God who just wants our heart anyway. 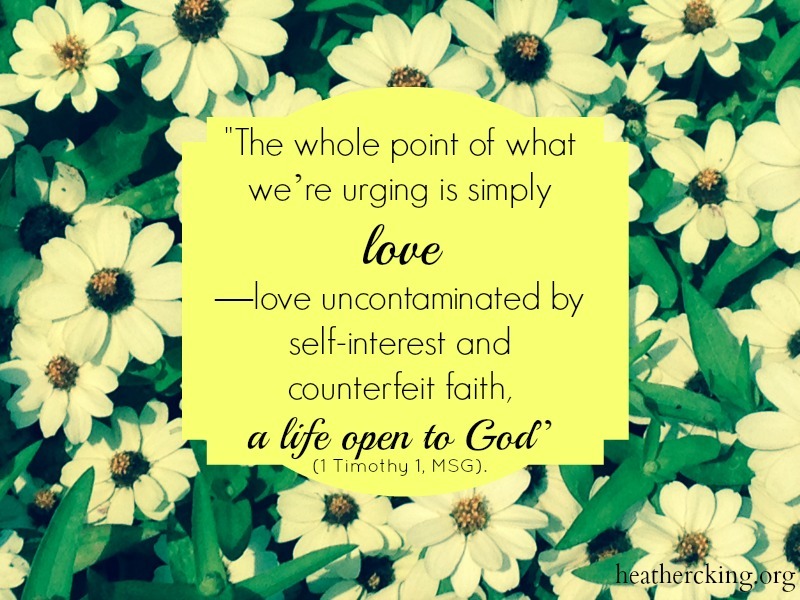 “The whole point of what we’re urging is simply love—love uncontaminated by self-interest and counterfeit faith, a life open to God” (1 Timothy 1, MSG). Is it a chicken? Missing coupons? Apple juice splatter or the pages of a book turned down at the corner? So, we choose to receive that grace and rest in it. We silence that self-condemning prattle in our mind and heart and decide: it’s okay if we didn’t get it all perfect today and if our life got a little bit messy. Didn’t we try our best to walk in that love? That’s the point and that’s enough. Now, it’s your turn: Do you have any bad habits?